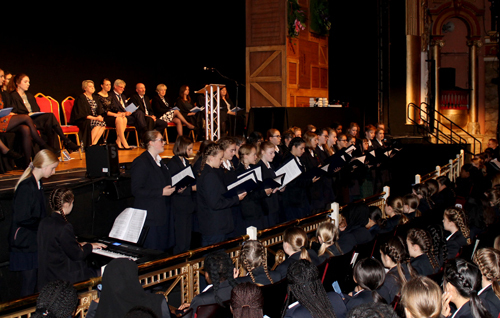 It was the perfect way to end Colston Girls’ School’s annual Prize Day event at the Hippodrome – students, staff, parents and carers, clapping and singing along to Kool and the Gang’s ‘Celebration’. Because that is exactly what it was – a wonderful morning celebrating all students’ achievements and triumphs throughout the year. It was also an occasion for students to hear inspiring messages from school staff, governors, and guest speaker, British Army Major, Marcelle Wright. Addressing the audience with a powerful message on resilience, Major Wright spoke about the struggles she faced as a child and the difficulties she experienced as an adult with her career and mental health. Major Wright joined the Army after university, but after seven years, decided to train as a dentist. However, only two years into her training, she failed her resits and was asked to leave the course. She told the audience that ‘failing was a big hard lesson to learn’. She then started working for a major bank in London, but after her partner was made redundant, she was signed off work with stress, depression and anxiety. Principal Mr John Whitehead spoke about the ‘exceptional’ exam results achieved over the summer and how proud he feels to be part of the CGS community. Speaking to the students, he said: “You are our future leaders – the people who will change the world, who will be the first to step on Mars, who will save the human race, who will end world poverty. He also gave a glowing tribute to the staff body and thanked governors, parents and carers for their ongoing support to the school. The audience also heard from Head Girl Lucy England, Master of the Society of Merchant Venturers Charles Griffiths and Chair of Governors Gillian Camm. Dozens of prizes were received by students. Danlei Zhu collected the Principal’s Prize for Academic Achievement, Kristina Brocklebank picked up the Merchant Venturers’ Leaving Prize and Zainab Adelopo claimed the John James Award for Outstanding Achievement. Lucy Britton received the house prize awarded in memory of Tatiana Stankovic Davis. Olivia Wright picked up three awards – the Edith Openshaw Prize for Mathematics, John James Foundation Prize for Further Mathematics and the Principal’s Prize for Services to the School. She has just started at Nottingham University, reading mathematics. In addition to the Merchant Venturers’ Leaving Prize, Kristina Brocklebank received three other awards: The John James Foundation Prize for Physics, the Nora Killip Trophy for Music and the Lucy Knight Memorial Prize for Chemistry. She is studying astrophysics at Southampton University.